Benefits of Ponds and Waterfalls - Install yours Today! A pond benefits your local ecosystem through self-sustaining cycles of hydration that give life and sustenance to plants and animals. Though it must be filled with plenty of water initially, over time water gardens use less water than a grassy lawn, saving you money in the long run. In today's busy world, it's important to have a relaxing place to escape daily stress. Having water garden features in your yard means that a private oasis is only steps away from your back door, keeping your body and mind in prime condition. Enjoying the therapeutic sights and sounds of flowing water will keep you and your family feeling rejuvenated and refreshed. With water on your property, it will be difficult to stay indoors! You can experience the growth and life of Mother Nature through the water features that help sustain the life of the pond and the fish that reside in it. In fact, your family will be impacted as they learn first hand about the elements of a thriving ecosystem. Grandkids want to stay inside and play video games? Family members turning into couch potatoes when they come over for a get-together? The addition of a pond to your outdoor living space is so much more than just digging a hole in the ground! A pond incorporates unique interest with sights and sounds that sooth and intrigue. Kids are drawn to the water and want to look at the fish and check out dragon flies and frogs. Many people build small beaches where little ones can get their feet wet and hold their hands under a waterfall. Being outdoors builds curiosity and confidence in children. Nature brings a calm and fun aspect to children’s lives and you can bring of bit of that nature to your own backyard. Children love to feed the fish, and the soothing sound of the falls will relax the adults too! A water feature provides the perfect atmosphere for outdoor entertainment and enjoyment. With it, your backyard will be a fun and relaxing place to host parties for friends and family year-round. The only problem is that you'll make all your neighbors want one too! 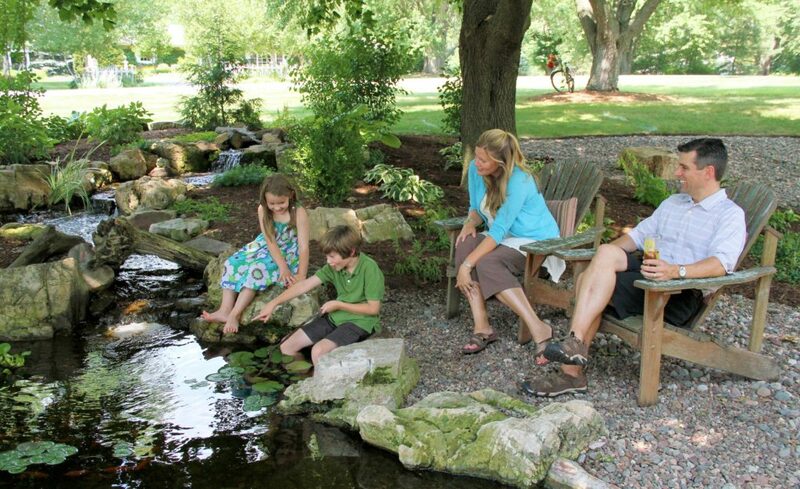 All pond systems we install require very little maintenance, leaving you more time to make lasting memories outdoors. And with features like fountains or even pondless waterfalls, you can enjoy the sights and sounds of natural flowing water whenever you please. So if you want to turn your backyard into a tranquil oasis, we can install a water garden designed to enhance your life and landscape. A beautiful water garden adds value to your home—both monetarily and sentimentally . It's a worthwhile way to make your home stand out from the rest and raise its property value. Even better are the priceless memories you will make with your family as your spend hours outdoors enjoying the water.